The Teen Adventure Camp (TAC) program is filled with fun camp activities, overnight adventures, challenging team problem solving on the high ropes course and low ropes initiatives course, rock climbing at Taylors Falls, a trip to a zip line tour including 3000 feet of zip and a four day river canoe trip. Campers will spend their time growing and learning more about themselves through personal challenges and adventure. The Teen Adventure Camp will be led by experienced Icaghowan staff. During a river canoe trip, campers experience the challenge of navigating river waters and living in the outdoors. 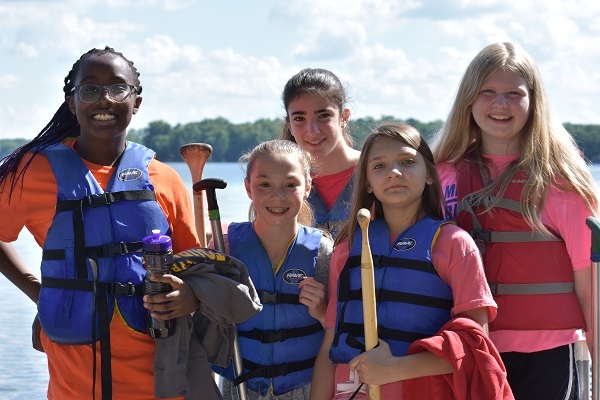 Campers start with two days of in-camp skills and safety training, trip preparation and then head out for 10 days of canoeing on a river in Northern Wisconsin, covering 100 – 125 miles! Trips are led by experienced Icaghowan staff. Islanders is a great opportunity for older camper to continue to expand their wilderness camping experience. They will leave Wallace Island to dip their paddles in the crystal-clear waters of Lake Superior on a 5 night 6 day sea kayaking adventure. They will camp in the picturesque Apostle Islands National Lakeshore with 2 Icaghowan counselors and 2 expert sea kayaking guides through Living Adventures out of Bayfield, WI.